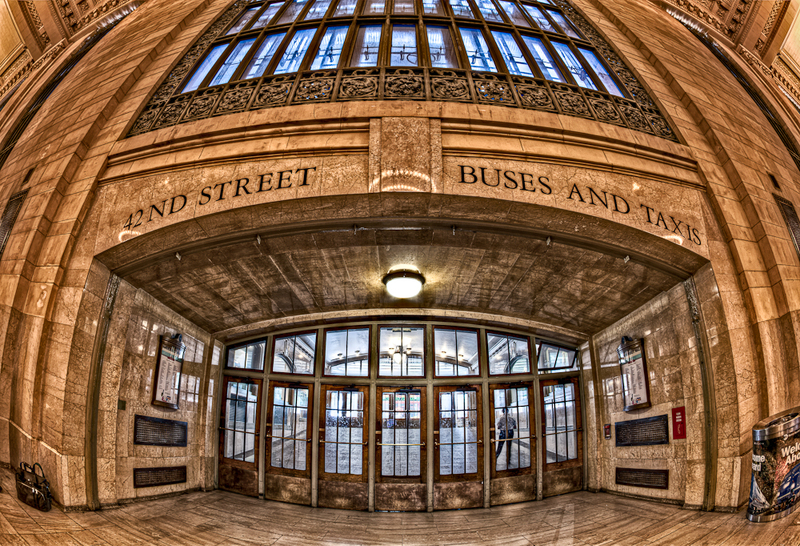 This 9 exposure HDR image with my 15mm fish is of the south exit to 42nd Street & Park Avenue. I was on a photo shoot here with some great photographers when I happened the exit at a time when I could get 9 brackets fired off without anyone walking into the frame. If you shoot HDR, you know what kind of challenge it can be in an urban setting to get brackets shot without any interference. Usually there are images ghosted in and you spend a lot of time thinking about how to make the image most impactful with the movement. And, as anyone who has been to Grand Central Terminal know, this is about as urban a setting as you can get on any given morning My shoot this day included Steve Beal, Brian Matiash, Bob Lussier, Jesse Pafundi and Brian Furbush. Now, in the spirit of full disclosure, we were in Vanderbilt Hall at this exit and I had my camera perched on my tripod, with my boy Steve Beal just behind me looking at the exit. I turned and said to Steve, hold up the traffic from moving so that I can get the brackets fired off. Without missing a beat, Steve punks out and says, “I don’t feel comfortable with that,’ at which point I thought, man what a @*&$#!!!!! and took matters in to my own hands and asked people to hold up walking for about 30 seconds. Beal is on the floor dying that I had the audacity in the middle of rush-hour to have people stop and wait for my brackets to fire off. The one person in the image is the guy on the exit side of the doors which you can see if you look to the right of the image through the doors. Save for that guy, and the briefcase on the far left of the image, it is a rare shot of a very still GCT. Steve – thanks for the help on this one brotha!!!! Peace & love. Posted on Sunday, October 30th, 2011 at 11:02 pm. Filed under: Architecture, Grand Central Terminal, HDR, New York City Tags: fisheye, GCT, Grand Central Terminal, HDR, New York City, NYC	RSS 2.0 feed. Really fun shots. Wish I could have gotten there earlier! Definitely a great shot of this iconic station Chris. Love how it turned out and it’s also a good bonus to see such a talented crew together!